Market-driven focus leads companies to build products people want to buy. The Strategic Role of Product Management explains why product management is a critical, strategic role in a technology company. One which guides products to be created based on a market need, not because someone thinks it is a good idea. Though the role of product manager differs from one company to the next, most product managers I know believe they drive the strategy for their products. I suppose in most cases they do. Strategic product managers spend time understanding the market and directing product activities toward meeting those activities. CEOs and other executives don’t always (or often) understand this. Therefore, part of the product manager’s job becomes educating executives on the strategic importance of understanding the market. Instead of talking about the company and its products, the successful product manager talks about customers and their problems. A product manager is the voice of the market full of customers. Control is not leadership; management is not leadership; leadership is leadership. If you seek to lead, invest at least 50% of your time in leading yourself—your own purpose, ethics, principles, motivation, conduct. Invest at least 20% leading those with authority over you and 15% leading your peers. 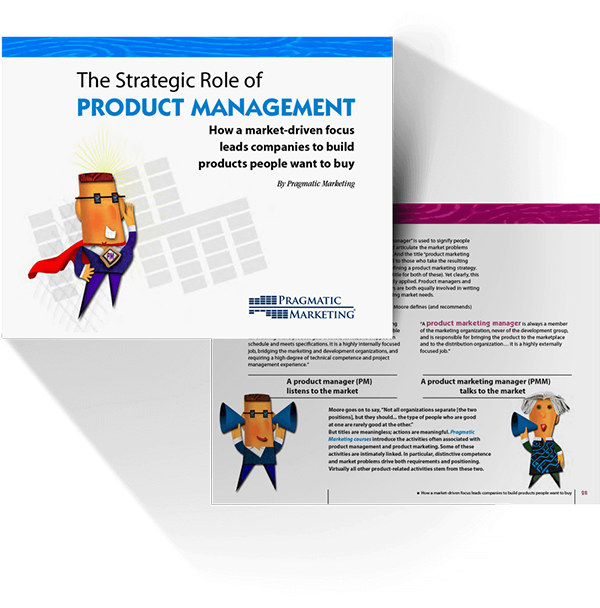 Pragmatic Institute has written an e-book, The Strategic Role of Product Management. In it, Pragmatic argues that strong product management is key to the success of a company when it is strategic and focuses on identifying and solving market problems. Increasingly we see companies creating a VP of Product Management, a department at the same level in the company as the other major departments. This VP focuses the product management group on the business of the product. The product management group interviews existing and potential customers, articulates and quantifies market problems in the business case and market requirements, defines standard procedures for product delivery and launch, supports the creation of collateral and sales tools by Marketing Communications, and trains the sales teams on the market and product. Product Management looks at the needs of the entire business and the entire market. What can you, as a corporate executive, do to enable the strategic product management that will contribute to your company's success? Create a product management department in your company. Ask your product managers to lead the company's positioning efforts. Hire interaction designers and user interface designers that free your product managers to focus on documenting market requirements. Support your product managers' efforts to call and visit both prospective and existing customers. Make sure your QA team tests not just against technical specifications, but also tests that your products solve the problems your product managers identify in the market. Make sure your product managers are experts in the principles governing positioning, pricing, and naming. Above all, stand up for the strategic recommendations of your product managers. In the face of interdepartmental paralysis, effective product management requires strong executive support.